Preheat oven to 350 degrees. Bake potatoes until easily pierced with a fork. Let the potatoes cool slightly, then peel. Pass the potatoes through a ricer or grate them into a large bowl. Add the egg to the potatoes. Mix well. Add the flour to potatoes a little at a time, mixing well. Add just enough flour so that the dough doesn’t stick to your hands. Remove the dough from the bowl and place on a slightly floured surface. Knead for about 5 minutes. Form the dough into a ball and then divide it into 5 or 6 smaller balls. On a lightly floured surface, roll out the dough into a rope using your fingertips, about 3/4 inch thick. Cut the dough into 1 inch pieces. Press each piece of dough against the tines of a fork to create ridges. Place the gnocchi in a single layer on a lightly floured dish. To cook the gnocchi, place the dough into a pot of boiling water. After a few minutes the gnocchi will float to the top. Continue to cook for one minute then remove and top with your favorite sauce. I triple this recipe and freeze a large portion. 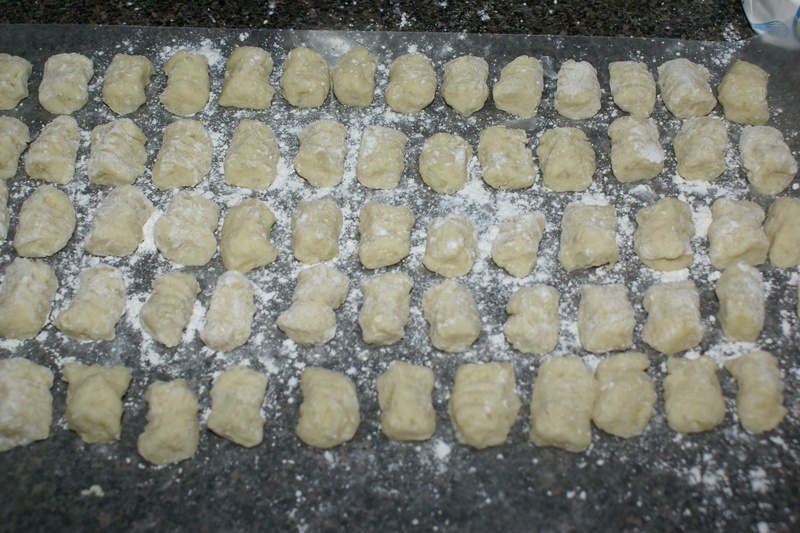 To freeze, line a cookie sheet with wax paper, and dust with flour and arrange the gnocchi in a single layer. Put the cookie sheet in the freezer to ‘flash freeze’ the gnocchi, about 30 minutes. Place in freezer bag to cook later. Cooking instructions are the same as above. No need to thaw.